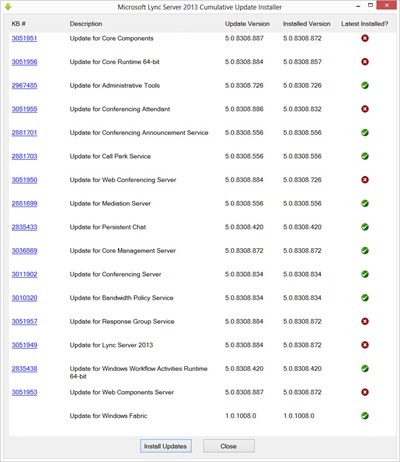 Buried in amongst the excitement of yesterday’s arrival of the Skype for Business Server 2015 ISO on MSDN and the swarm currently descending upon Chicago is quite a worthy update to Lync Server 2013. This one takes Lync Server 2013 from 5.0.8308.871 (or 5.0.8308.872 depending upon where you look) to 5.0.8308.887. Is this a pre-req for Skype for Business 2015 server? Strictly, no, but in reality it’s looking more like a YES. 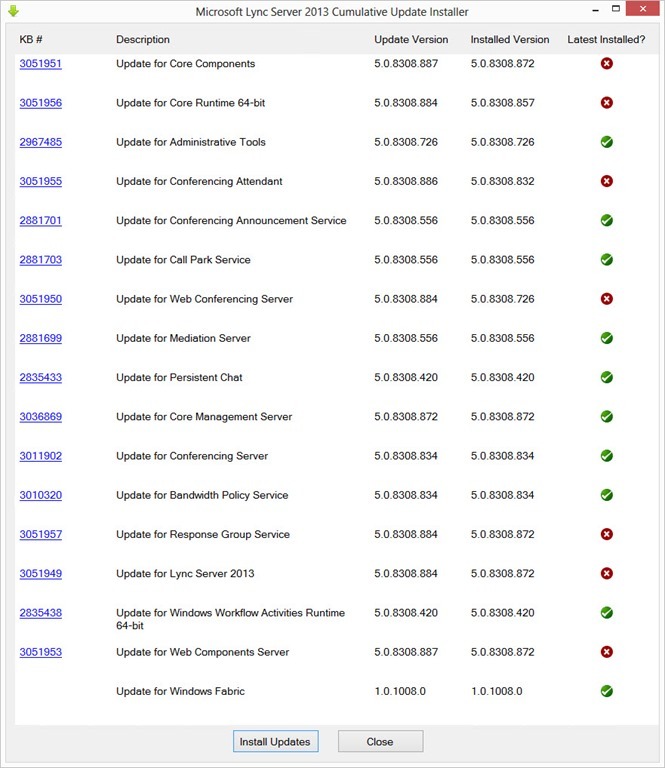 If you’re planning on performing an in-place upgrade of your Lync 2013 server to Skype for Business the published minimum is 5.0.8308.738, which was the August 2014 update. I think this is overridden by one of the fixes above (kb3062801) that addresses a known issue with conferencing data loss when migrating users to a Skype for Business pool. So by my reading that makes this KB a pre-req! The September update last year listed as a pre-req that “You must make sure that all instances of the Event Viewer and Performance Monitor windows are closed before you install this cumulative update” so it’s best to follow that guidance here – especially if your servers AREN’T presently already at least at 5.0.8308.815. A good test after applying the updates is to run Pat’s “Get-CsDatabaseUpdateStatus” script just to make sure you didn’t miss anything. There’s an update to the UCMA Runtime in this bundle, so if your Exchange 2013 server has the UM role installed it’ll want an update too! (If in doubt, just run the installer – it will tell you if UCMA is installed and needs the update. You can then back out and schedule it at a suitable time). 3rd May: Updated “is this a pre-req” to say ‘not officially, but yeah’. Why do we need to perform steps about enabling mobility and UCWA on a server that was recently patched. Following https://support.microsoft.com/en-us/kb/2809243 it seems that in such a case only steop 1 and 2 must be done. Unless I haven’t correctly understood your explenation. You’re absolutely correct. My steps 1-5 above align with steps 1 & 2 outlined in the KB, and in the sentence immediately prior to the list of steps I point out that if your server is already current you only need to run my steps 1-5. (There’s no harm in running enable-cstopology and bootstrapper.exe though).